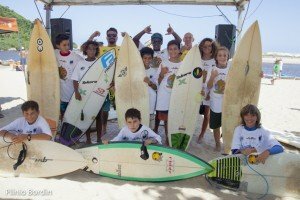 In November 2016, Save The Waves announced the approval of Guarda do Embaú as the 9th World Surfing Reserve. This past week the community of Guarda do Embaú showed unprecedented stoke for their recent approval and hosted a community-wide celebration. We are proud to share these photos and video with you and look forward to working closely with their Local Stewardship Council to protect the coastal resources that define their community and contribute to the classic sand bottom waves they enjoy year-round. Guarda do Embaú is home to a world- class wave that breaks consistently year-round and is known as one of the best surf spots in Brazil. It is situated directly adjacent to the Serra do Tabuleiro State Park, the largest conservation area in the Brazilian state of Santa Catarina, which boasts a stunning natural environment including the Do Madre River, an intact estuary system, and a mature sand dune system. The reserve will help address water quality issues and potential coastal developments. Home to the late Brazilian surfing legend, Ricardo Dos Santos, Guarda do Embaú’s approval has national significance. Brazil’s booming surf industry and growing dominance on the professional surf tour (WSL), has made it the second most popular sport after soccer. The World Surfing Reserve approval holds the promise to harness Brazil’s love of the sport for a deeper commitment to coastal activism and protection amongst the Brazilian surf world and policy-makers.